REBSEA is first and foremost INCLUSIVE of all business models used by socially responsible real estate agents and businesses who practice social enterprise. Social enterprise is defined as combining a for profit business with a social benefit. 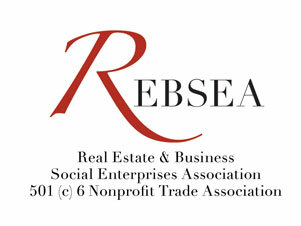 The PRIMARY GOAL of REBSEA is to promote the services of its members while raising funds for nonprofit organizations. 1) When REBSEA Members are working with a client who came to them through the REBSEA network they will make a donation after closing to a nonprofit organization. 2) Members decide how much to donate and to which nonprofit, as long as it is consistent with what they have written in the Directory. 3) Referrals between members of REBSEA will have no specific requirement and will be arranged entirely between the members. 5) Members are ENCOURAGED to use the REBSEA logo with a link to the REBSEA website in their promotional materials, website, business cards, etc. 6) Members are ENCOURAGED to approach the local NPOs that they want to support and have them inform their supporters about the REBSEA program and to develop a long term working relationship. 7) Members are ENCOURAGED to promote the goals of REBSEA through public relations, advertising, and use of both the social media and traditional media. 8) Members are ENCOURAGED to send the REBSEA newsletter and blogs to their sphere of influence.